We achieved customer satisfaction based on the quality in our services and personalized attention to each on for which we have established and implemented a Quality Management System based on ISO 9001:2008 which is certified and accredited since 2006. Only Terminal in Paraguay with a Certified Inspector under IICL Standards for Inspection and Container Repair. We provide safe operation practices and means to continuously improve Accident Prevention Systems and preparation of staff to act in emergencies for which we have established and implemented a Safety Management System based on OHSAS 18001:2007, certified and accredited since 2014. We understand that security of our facilities and stored cargo is vital for the growth and continuity of the Company and have therefore established and implemented a Security Management System based on the BASC Standards which is certified and accredited since 2010. We are also certified under ISPS (International Ship and Port Facilities – ISPS CODE). Our seals are certified under ISO PAS 17712 Standards. We have additionally established and implemented a Security Management System based on the International Ship an Port Security Code (ISPS) that is certified and accredited since 2004. Terport S.A. is the 1st Terminal in having a permanent National Anti-Drug Secretariat Office (SENAD); which further legitimizes the Company´s management and transparency towards the fight against drug trafficking, smuggling and money laundering. We recognize the importance of protecting the environment and the need to minimize the impact that the Company´s Operations may have on it for which we maintain Environmental Procedures and Controls based on ISO 14001:2004 Standards. Terport - Terminales Portuarias S.A.
Only Terminal in Paraguay with a Certified Inspector under IICL Standards for Inspection and Container Repair. We provide safe operation practices and means to continuously improve Accident Prevention Systems and preparation of staff to act in emergencies for which we have established and implemented a Safety Management System based on OHSAS 18001:2007, certified and accredited since 2014. 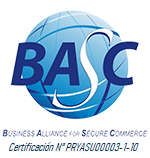 ONLY TERMINAL IN PARAGUAY CERTIFIED UNDER BASC STANDARDS (ACCREDITED BY THE US C-TPAT). We understand that security of our facilities and stored cargo is vital for the growth and continuity of the Company and have therefore established and implemented a Security Management System based on the BASC Standards which is certified and accredited since 2010. We are also certified under ISPS (International Ship and Port Facilities – ISPS CODE). Our seals are certified under ISO PAS 17712 Standards. We have additionally established and implemented a Security Management System based on the International Ship an Port Security Code (ISPS) that is certified and accredited since 2004. Terport S.A. is the 1st Terminal in having a permanent National Anti-Drug Secretariat Office (SENAD); which further legitimizes the Company´s management and transparency towards the fight against drug trafficking, smuggling and money laundering. We recognize the importance of protecting the environment and the need to minimize the impact that the Company´s Operations may have on it for which we maintain Environmental Procedures and Controls based on ISO 14001:2004 Standards.